Find North Shore pulmonary medicine physicians at NSPG. For patients seeking treatment for pulmonary conditions, North Shore Physicians Group (NSPG) offers exceptional pulmonary medicine doctors at convenient North Shore locations. Our pulmonary medicine physicians provide state-of-the-art care to patients with pulmonary disease, sleep disorders and illnesses related to the lungs and respiratory system. NSPG is a multi-specialty practice of more than 200 physicians, nurse practitioners and medical professionals, and is affiliated with North Shore Medical Center, the largest and most advanced health care center in the region. In addition to pulmonary medicine, NSPG offers patients family medicine specialists, internal medicine physicians and geriatric care doctors, as well as many other specialists. 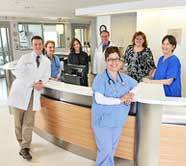 Our pulmonary medicine physicians see patients at offices in Salem and Lynn. Outpatient pulmonary and sleep consultations, including spirometry testing and ambulatory oximetry testing to determine whether a patient requires supplemental oxygen. Home testing to diagnose sleep disorders. Inpatient pulmonary consultations to evaluate, diagnose and treat pulmonary disorders. Intensive care for critically ill patients at NSMC Salem Hospital. Pulmonary rehabilitation and long-term acute care for respiratory failure requiring mechanical ventilation. Diagnosis and treatment of pulmonary tuberculosis, working closely with the Massachusetts Department of Public Health. Treatment of sleep disorders like sleep apnea, using advanced monitoring techniques to diagnosis disorders and provide comprehensive follow-up care and education. Primary care at NSPG: your gateway to pulmonary medicine. Our primary care specialists refer patients to NSPG pulmonary care physicians. We have primary care medicine specialists at locations throughout the North Shore. Adult patients typically choose to see an internal medicine doctor, while families sometimes prefer to see a family medicine doctor who can treat all members of the family. Some patients opt to see a physician in our concierge medical practice, where the internal medicine physicians are able to provide more extensive attention to each of their patients. Finally, some patients find great benefit in participating in our shared medical appointments, where six to 10 patients meet with a physician at the same time for intensive education and group support.